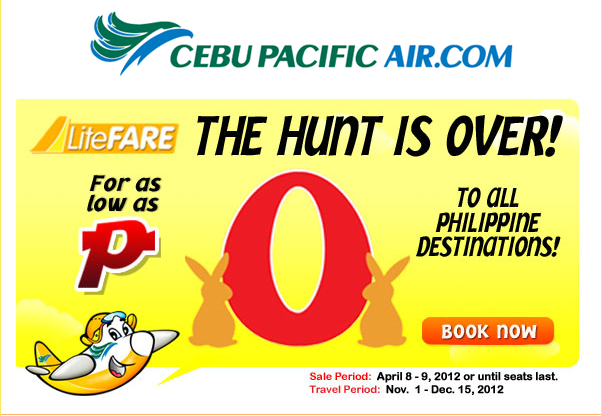 The Philippines’ largest national flag carrier, Cebu Pacific (PSE:CEB) offers P0 fares for all Philippine destinations, starting April 8, 2012 until seats last. This seat sale is valid for travel from November 1 to December 15, 2012. ZERO fares are available to travelers going to Bacolod, Boracay (Caticlan), Busuanga (Coron), Butuan, Cagayan de Oro, Catarman, Cauayan (Isabela), Cebu, Clark, Cotabato, Davao, Dipolog, Dumaguete, General Santos, Iloilo, Kalibo, Legaspi, Laoag, Manila, Naga, Ozamiz, Pagadian, Puerto Princesa, Roxas, San Jose (Mindoro), Siargao, Surigao, Tacloban, Tagbilaran, Tawi-Tawi, Tuguegarao, Virac and Zamboanga. The seat sale fare quoted is for one-way travel, exclusive of government fees, taxes and fuel surcharge. “We continue to promote travel for November until mid-December so that our guests can get the ultimate savings from our trademark low fares and the best deals at their destinations during lean season. CEB is making more than 60,000 seats available at ZERO fare, so guests can make the most of their vacations,” said CEB VP for Marketing and Distribution Candice Iyog. “For our guests’ added convenience, CEB’s web check-in service and automatic seat selection can now be used for free while booking online. To avoid the long lines at the airport, we also encourage guests with check-in luggage to avail of prepaid baggage allowance when booking online for travel savings of as much as 63% on domestic and 72% on international flights,” added Iyog. Guests without credit cards may also book online and pay through CEB partner banks and payment centers. Low Fares For May to August 2012 Travel! Cebu Pacific Domestic Seat Sale This SUMMER!